Grace is just one of the women in the JED SIMPAP vocational training program. She is learning tailoring as a means to generate income that will provide for her children. You can support JED/SIMPAP as they stand with and empower these single mother refugees during a very challenging period in their lives. JED would like to continue to expand the vocational training programs they are offering so as to allow these single mother refugees to have a means to generate their own income, be able to pay their children’s school fees, and meet other basic needs in the family. 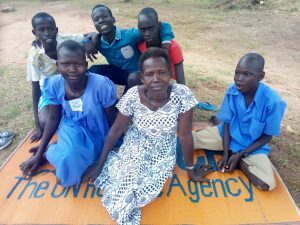 The 2018 South Sudan Fund would like to make a grant of at least $20,000 to JED for their SIMPAP program to allow them to sustain and expand their programs. 100% of your donation will go to JED for the SIMPAP program.